European Space Agency (ESA) organises a series of summer schools on Monitoring of the Earth System to promote the exploitation of Earth Observation EO data across disciplines, with a specific focus on their assimilation into Earth System models. The two-week course, held in ESA/ESRIN (near Rome, Italy) during August (typically every two years) aims to provide students with an integrated end-to-end perspective going from measurement techniques to end-user applications. Courses include lectures covering issues related to Remote Sensing, Earth System Modelling and Data Assimilation as well as hands-on computing exercises on the processing of EO data. Students have the opportunity to present their work during a poster session. The three best posters will receive an award from the European Meteorological Society (EMS). Keynote lectures on global change issues are also given to discuss the current state of the science of global change and its relationship to society in order to help students appreciate how their specific field fits into a broader scientific and political context. For more information, please see previous programme, news or video. The school is open to Early Career Scientists (i.e. Ph.D. students, young post-doctoral scientists) who are specialised in a variety of Earth Science disciplines and wish to expand and improve their knowledge and skills. Participation is limited to a maximum of 60 students and is highly competitive. There is no fee for the school but students are expected to cover their own travel and accommodation cost (unfortunately, financial support is not available). The GIS and Remote Sensing Centre of the University of Girona, the Nottingham Geospatial Institute of the University of Nottingham and Prodevelop (partner of OpenGeo) welcome you to the 5th Open Source GIS Summer School which will be focused on the development and creation of Open Web Mapping Services and Web Applications. The Open Source Opportunities in GIS Summer School of Girona is an initiative aimed to meet the GIS professional demands related to free and open solutions. GIS Open Source Summer School 2014 aims to build upon the success of the previous editions to ensure the highest quality of results and to prepare students in an international working environment and to develop competitive skills with emphasis on collaboration during the course. We started on this initiative focussing on the advantages of using Free and Open Source Software for GIS from the first edition of this Summer School. If you are interested in application development and creation of web map services using the most widely used free and open source market products such as PostGIS, GeoServer, OpenLayers, then this is your opportunity. Applications to the Summer School must be submitted before 27th June. A new concept of Museum was born on June 30, 2012. Taking advantage of the latest technologies for virtual visits to archaeological sites and Photogrammetry 3D objects, was created the first Museum Virtual of the culture Castro (www.muvicc.es) under the name of MUVICC. A new technological tool for dissemination and digitization of objects, museums and archaeological sites. Over the past few years the extent and quality of information available from satellites, airborne laser scanning (LiDAR) and aerial photography has grown exponentially. These techniques, collectively referred to as remote sensing, have had an enormous impact on our ability to reveal past landscapes and disseminate knowledge about those landscapes. The results of this work can be both visually exciting and intellectually engaging. ArchaeoLandscapes Europe offers a small number of bursaries/grants to support students and young scholars to participate in ArcLand related events and activities. 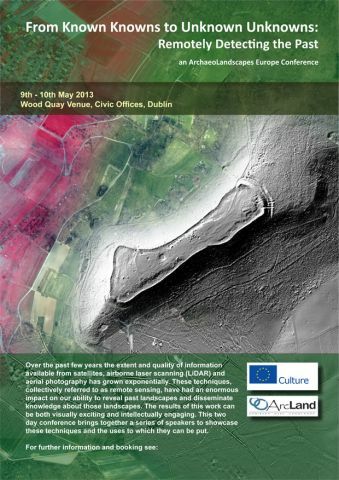 Forms for grant applications can be found on the ArcLand webpage (see http://www.archaeolandscapes.eu/index.php/en/outreach/grants.html for details) and will have to be send to the project leader by email until 5th April 2013. The 8th International Symposium on Digital Earth 2013 (ISDE 2013) will be held in Kuching, Sarawak, Malaysia from 26th – 29th August 2013. This symposium is an important event of the International Society for Digital Earth. The theme “Transforming Knowledge into Sustainable Practice” aims to enable digital earth modeler and experts in the field of geospatial science and technology to provide a brand new opportunity to share their ideas and insights on how we share knowledge and act together globally. The abstract deadline submission has been extended till 31st March 2013. All accepted papers will be published online in IOP Conference Series: Earth and Environmental Science with high visibility and indexed in Scopus, El Compendex and Inspec. Selected papers will be invited for review for special issue in the International Journal of Digital Earth, Indexed in SCI-Expanded, with impact factor 1.083 (2011). A Workshop entitled “Digital City & Green Cities: Towards Urban Sustainability” will be held in conjunction with the Symposium on 26th – 27th August 2013. Address the principles and mechanism for enhancing national, regional and international awareness of digital city concepts in achieving sustainability. Identification of research activities and implementation those are more relevant to the needs of decision makers in international, regional, national and local levels. A youth programme is to be organised at UNIMAS, Kuching, Sarawak on 23 – 25 August, 2013 hosted by the Universiti Teknologi Malaysia (UTM) and Universiti Malaysia Sarawak (UNIMAS). To demonstrate geospatial analytical tools, including image processing of remotely sensed data and GIS software to indentify, quantify, and report on priority rural planning information, and to develop sustainability scenarios for rural development through laboratory and field investigations using geospatial tools. The Digital Library for Earth System Education (DLESE) (http://www.dlese.org/library/index.jsp) is a distributed community effort involving educators, students, and scientists working together to improve the quality, quantity, and efficiency of teaching and learning about the Earth system at all levels. DLESE resources include electronic materials for both teachers and learners, such as lesson plans, maps, images, data sets, visualizations, assessment activities, curriculum, online courses, and much more. The National Science Foundation provided funding for the development of DLESE which is now operated by the National Center for Atmospheric Research (NCAR) Computational and Information Systems Laboratory and the NCAR Library on behalf of the education community.